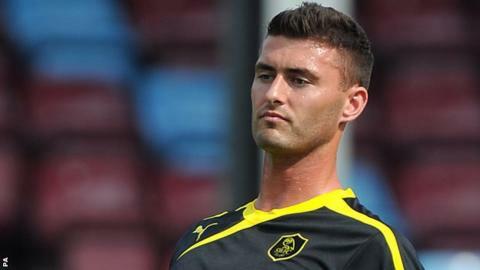 Carlisle United boss Graham Kavanagh has revealed striker Gary Madine overcame injury to play a key role in Saturday's 1-0 win against Swindon. Madine, 23, scored his first goal since arriving on loan from Sheffield Wednesday to seal three vital League One points for the Cumbrians. Kavanagh told BBC Radio Cumbria: "He had a problem with his groin. "We kept it under wraps and tried to nurse him through it but he stood up today and got the goal." The Birtley-born striker was allowed to rejoin Carlisle - for whom he made 91 league appearances between 2007 and 2011 - following his release from prison in February after an 18-month term for separate assault incidents in Sheffield. United were quick to express an interest and Kavanagh, a player and coach during Madine's previous spell, believes he can be a positive influence on the player. "I have a very good relationship with Gary and an honest relationship with him I think," Kavanagh said. "I tell him what he needs to hear at times but I also give him a kick up the backside when he needs it. "I think he is mature enough to understand the difference, his performances are certainly doing that, he is one of a few players who want to come and play for Carlisle."